While we were somewhat behind on our viewing and reviewing of Blade Runner 2049, Happy Death Day only comes up short in the managing to post our review on YouTube in a timely manner category as we saw the new teen slasher movie last Thursday, on the eve of Friday the 13th, just as it was meant to be seen. 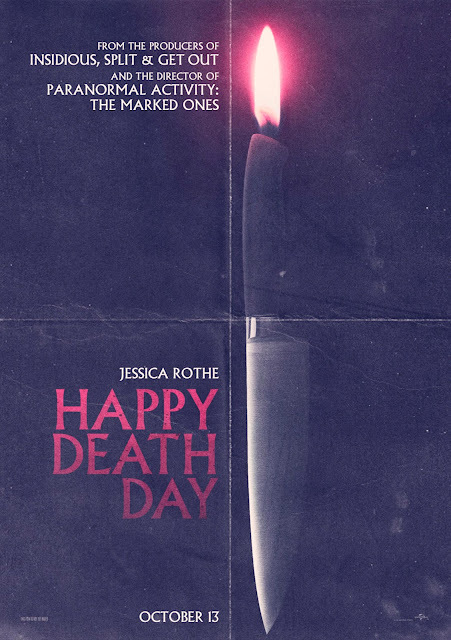 That said, having Happy Death Day debut on a Friday the 13th in October is a no-brainer and both Universal and Blumhouse reaped the benefits as they scored another win in the horror genre for the third time this year after the massive successes that were Split and Get Out. The Christopher Landon-directed horror flick (that is just as much a comedy, honestly) easily topped last weekend's box office by raking in $26.5 million and outperforming the opening weekend for The Visit, which went on to gross $65.2 million two years ago. Based on the average for Blumhouse titles debuting over $20 million, it seems completely reasonable to expect Happy Death Day will also make a $60 million domestic run, especially given there are two weekends remaining before Halloween and college students will be on fall break at some point in that timeline which, not surprisingly, was what made up the majority of Happy Death Day's audience. Scoring a "B" CinemaScore from opening day audiences the film saw 63% of that audience being under the age of 25 proving kids do in fact still go to the cinemas, at least every once in a while. Happy Death Day also debuted in 11 markets last weekend and brought in an estimated $5 million for what currently sits as a $35 million worldwide total with the film set to open in 16 more territories, including the U.K. this weekend. Meanwhile, Blade Runner 2049 dropped over 50% in its second weekend, while STX's The Foreigner debuted with a modest, but good for its budget 12.8 million from 2,515 theaters. Lastly, Open Road's Marshall delivered on expectations with an estimated $3 million from 821 locations. As always, be sure to follow the official Initial Reaction YouTube channel as well as on Facebook, Instagram, and Twitter where you can find a new review (or reviews) each week! Read my full Happy Death Day review here.